This is a replica of a sword that was used around the 14th-15th century. Although the length derives from the average medieval swords, it can be typified as an Oakeshott type XIIIb based on the blade and cross-guard. The blade is made of CSN 14260 carbon steel with a Rockwell hardness of 54 to 56 HRC. The pommel and cross-guard are made of steel. 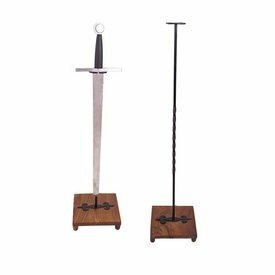 The sword has a length of 78 cm with a blade of 58,8 cm and its max. width is 3,8 cm. 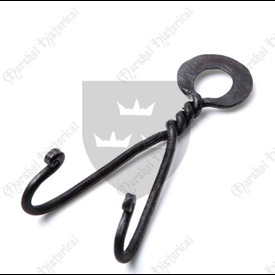 The cross-guard has a length of 15,5 cm. It weighs approx. 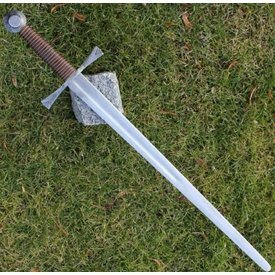 1120 g.
This sword is an Oakeshott type XIIIb.